Gendün Chöpel (Tib. དགེ་འདུན་ཆོས་འཕེལ་, Wyl. 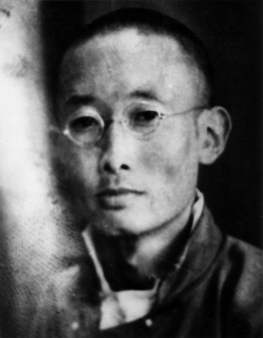 dge 'dun chos 'phel) (1903-1951) was one of the most original thinkers in Tibetan history. He was a philosopher, historian, artist, translator, traveller and a campaigner for the modernisation of Tibet. He translated the Dhammapada from Pali into Tibetan. His life is documented in the film Angry Monk: Reflections on Tibet (2005). Gendün Chöpel was born in Amdo in 1903 and received his early monastic training at Labrang Tashikyil, before travelling to Lhasa and entering Gomang college at Drepung Monastery in 1927. Whilst there, he studied logic and epistemology (pramana), Prajñaparamita and Madhyamika, excelling in debate. He gave up formal studies in 1934, and accompanied Rahul Sankrityayan on a search for rare manuscripts in the monastic libraries of southern Tibet, including that of the great temple of Sakya. For the next twelve years, he travelled extensively throughout the Indian subcontinent, learned Sanskrit, Pali and English, and collaborated with George Roerich in his monumental translation of Gö Lotsawa's Blue Annals. While in India, Gendün Chöpel wrote many original works, including a guidebook to the major pilgrimage places of India, a treatise on eroticism ('dod pa'i bstan bcos), a history of Sri Lanka, works on the origin of Tibetan script, and an unfinished work on the early history of Tibet called the White Annals, as well as writings on geography, in which he argued against the traditional presentation of cosmology given in the abhidharma literature. He also wrote on the subject of politics, and became involved with the Tibet Improvement Party, which was based in Kalimpong. After returning to Tibet in 1946, he was arrested on counterfeiting changes, and sentenced to three years in prison. He passed away in 1951, only two years after his release. Perhaps his most famous and controversial work, An Ornament to Nagarjuna's Intent (klu grub dgongs rgyan), compiled from instructions he gave on Madhyamika shortly before he was imprisoned, was published after his death. Gedun Choephel. The White Annals. Translated by Samten Norboo. Dharamsala: Library of Tibetan Works & Archives, 1978. Download at https://archive.org/details/81480283GedunChoephelTheWhiteAnnals. Gendun Chopel. Grains of Gold: Tales of a Cosmopolitan Traveler. Translated by Donald S. Lopez Jr and Thupten Jinpa. University of Chicago Press, 2014. This page was last edited on 9 February 2019, at 12:49.